The championship match of the 2010 FIRST Robot Competition is starting soon. Many teams have fallen and many robots have fallen apart. But now it's just the best student-made bots of the lot, battling for all the glory. Watch inside! You can watch the stream of the event, provided by NASA, here. Learn about the competition here. I'm watching too, so watch that in one tab and refresh this post in the other! 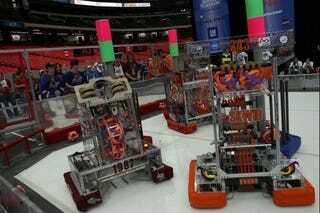 We'll be back on Monday with a close-up look at the winning robots. I had a blast watching the competition today, and, if you tuned in, you saw just how bright our engineering future looks. These kids simply radiated excitement at the FRC championship today. Dean Kamen pledged to push the FIRST program harder than ever this coming year, with the hope of getting young people across the nation hooked on science and technology. 6:44: And that's all she wrote! Congrats to all the teams who participated, and especially Team 67, Team 177, and Team 294, the big winners. 6:42: RED ALLIANCE WINS! 16-13! New World Champions! 6:40: Blue's off to an early lead! 6:38: Oh yes! Finals match 2 about to start. If the Red Alliance wins, they're the champions! 10. On the census form, you listed your primary residence as your robot build site. 8. You are lobbying your Congressional representative to vote no for health care until robots are covered. 6. You think if World Cup Soccer was played with 12 balls, Americans might actually watch it (huge applause, here). 4. You get in trouble in gym class for trying to hang from other kids who are doing pull ups. 2. Your parents are furious because you put red and blue interchangeable bumpers on the minivan. 1. You love Atlanta, but you are already scoping out hotels in St. Louis! (apparently this is the site of next year's competition). 6:34: Black Eyed Peas bumping on the speakers. It wouldn't be a 2010 robotics competition without them, after all. 6:31:"Being the new kid on the block isn't easy"—congrats to team Innovators Robotics, winners of the Rookie of the Year award. 6:27: The creativity award, by Xerox, is next. NOT the copycat award, mind you. It goes to team Las Guerillas, from Bloomfield Hills, MI, for their 10 pound aluminum bot. 6:26: Oh this is cool, though—the woman from Johnson and Johnson is telling a story about how team Ice Cubed busted a criminal who stole a FIRST robot. 6:25: The Gracious Professional award, presented by Johnson and Johnson, for teams with "grace and humility." Robots know no humility, Johnson and Johnson! Don't let Wall-E fool you! 6:22: Hmmm, one of the 7 teams sponsored by Motorola was called the "Space Cookies." 6:21: The Red Alliance wins the first finals match 16-14! That was close. 6:20: Oh I like this big yellow pyramid bot. 6:19: The Superbowl of Smarts, the announcer calls it. It's true—watching these youngster-made machines is pretty inspiring stuff. 6:18: A Michigan squad on both teams! We win no matter what! 6:17:The announcer is doing a handstand. Things are getting wacky. Atmosphere at the Georgia Dome seems electric. 6:15:TIME FOR THE FINALS. I've been waiting all day for this! 6:14: Engineering Excellence award goes to team Patriotics, from Ontario. Theirs is definitely one of the sleeker looking bots of the bunch. 6:07: Time for the special judges award. They're giving it to the Ridgeview Academy Rambotics, the "best dressed team in Atlanta." The team is, in fact, very well dressed, operating their bot in full bow-tie get-up. 6:06: Red Alliance wins! They will play in the championship. 6:05: I hear "I like to move it, move it," in the background at the Georgia Dome. That can only mean that the championship is drawing near. 6:00: Ooh, tie-breaker semi-final match. 5:54: These bots are not so polite. Lots of smashing into each other. 5:53: So this is pretty hectic, but I think this is how these games work: The first 20 seconds or so are left for autonomous robot soccer, where the bots just seek out the balls on their own and try to score. Then the students are allowed to control their bots with joysticks. 5:52: This announcer has an excellent hold on the recent history of FIRST robotics championships. He knows the history of every single team that's still left, and there's not a single teleprompter in sight. 5:50: The last semi-final match is here! 5:48: The industrial design award goes to team Killer Bees from Auburn Hills, MI. I'm noticing that a disproportionate amount of these teams hail from Michigan, my home state. Why is that, I wonder? We have a disproportionate amount of militias, too, as you may know. 5:47: Impressive animations, to be sure. But I want some robot soccer action! 5:44: WHOA, winners of the AutoDesk design awards get iPads! 5:43: The fact that high school students made all these robots is really pretty amazing. I can't make some of the more complicated LEGO sets. 5:41: Liveblogging is stressful. I don't know how Chen does it. 5:40: Geez, these games go fast. Blink and you miss them. Semi Final 1, Match 2 just ended and the Blue Alliance won 22 - 14. 5:37: The announcer just said that team O.P. Robotics from Ontario Canada "owns Canada." Next year some Canadian teams are going to come hard. 5:36: So it seems like all of these team are perennial favorites. A lot of World Champs back again to fight for the FIRST crown in 2010. Watch here if you're not already. 5:32:: The Dedalus Project team, hailing from California, just won the imagery award for the prettiest bot. 5:26: Here's a rap song about FIRST and the joys of robotics, called "Dream It, Design It, Build It," that you can listen to to pump yourself up for the final match. Nice production values! Dean Kamen, the founder of FIRST (and inventor of the Segway), is giving away some awards before the final showdown. Top photo from last year's challenge.